In addition to having a nice place to sit and enjoy the outdoors, the deck provides an informal entrance for us coming from the garage without having to go through the front door. Landscaping screens the deck from people on the golf course out front. We started off wanting a concrete deck with ceramic tile. 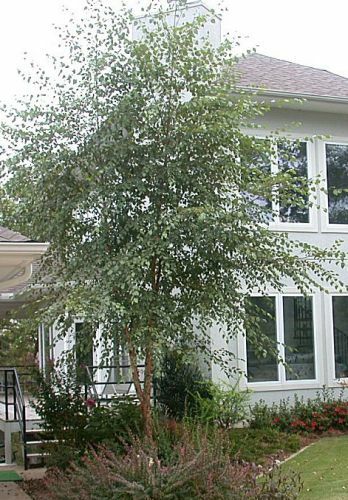 We figured this would look more contemporary and would last a lot longer and require less maintenance than a wooden deck. Builders we talked to made a suspended concrete deck sound unreasonable, so we gave up and settled for a wooden deck. However, a friend of ours just moved into his new house which has an attached garage with a suspended concrete floor with crawl space underneath, so now we regret that we did not at least look into the cost of it. It might have been possible to have a tile deck without having a slab, but we never considered that at the time. The main reason we were given for not having a tile deck is that it would be slick when wet. We are not convinced that potential problem could not have been solved. While a tile deck costs more initially, a wooden deck must be power washed and resealed every couple of years at a cost (for our deck) of around $1000 -- *IF* you can find somebody to do it, which has not always been easy. Anyway, we have a wood deck. Craft had the wooden supports painted gray to match the stucco, and we specified a black metal railing instead of wood, so that it will look better and last longer. Since the side of the house is relatively straight (other than a bay area in the middle where the breakfast room is), we ran the deck the full length of the side of the house. We had to guess at how deep the deck should be, but settled on 10'. Now that it is up, this seems to be a reasonable size. In getting bids from builders, we specified that one end of the deck should be covered for a place to sit when it's raining, but we did not want the covered area fully enclosed. With the roof structure already up, we can always screen it in later, if we find it is necessary, for no more than it would cost to do it now. Craft came up with the best plan, covering the far end of the deck which is in front of the study. This leaves the views in front of the breakfast area and in front of the den completely unobstructed. A door on the far side of the breakfast bay area lets us walk directly into the covered area of the deck when it is raining without getting wet. 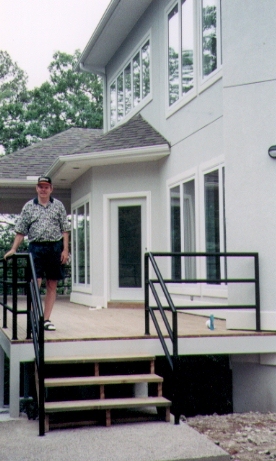 Although we could not get the contemporary tiled slab that we wanted for a deck, we did opt for steel railing instead of wood, which should give the deck a more contemporary look and last longer than wood. Two rare conflicts which we had with Craft were about the deck. 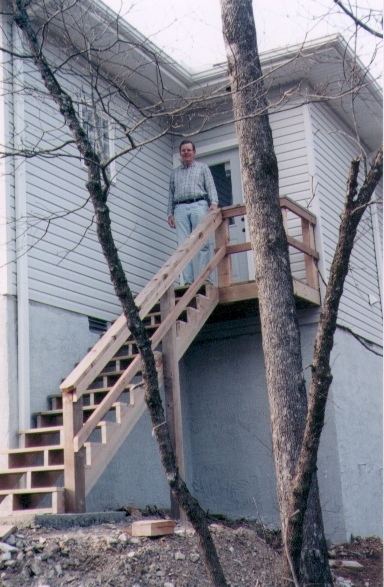 One was that, as with sheetrock and subflooring in the house, we wanted the deck screwed down. Instead, nails were used. Craft claims that using screws can lead to the wood's splitting. We were not 100% convinced on this, but we decided to let it go. Too bad, because many of the nails have popped up. The other conflict was over when the deck wood should be treated. Again, a home TV show (builders must hate these) said that it is an old wife's tale that deck wood needs to sit outside for some period of time before sealing. They explained that the problem for the wood comes from repeated getting wet (from rain) and drying out again, so it should be sealed as soon as it is put down. Craft still claims this is wrong and that it should sit for a year. The July 1999 issue of Consumer Reports had an article on deck sealing. It said that the deck should be sealed "as soon as it is dry". When the wood is "dry" is open to debate, but the article goes on to say that the wood should be sealed before it is installed so that all sides can be coated. This certainly doesn't sound like waiting a year. Craft adds an extra touch to the decking -- two sets of grooves which run the length of the boards. Everyone who has seen this has commented on how good it looks. Craft says it costs more to have them milled this way, but it is something he has always done. In July 2011, when it was time to spend another $1000+ resealing the deck, we decided to replace the wood with synthetic wood. The synthetic wood is thinner than the wood which was originally used, so it has more of a spring to it when you walk across the deck. We chose a light gray. Dark gray would have been a better choice because it would not have shown dirt as much. 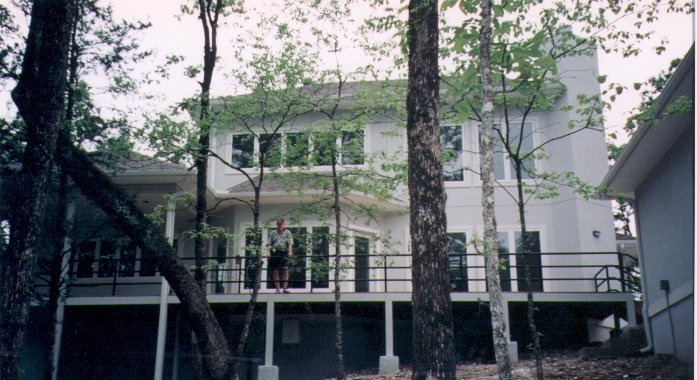 The picture on the left shows a small deck and staircase which come out the back of the house. This deck's origins are kind of funny. When the floor plan was finished, Kay said she wanted a door from outside into the laundry room so that Nelson would have a place to come in and shed filthy clothes without tracking through the house. It would also be the only door in the back of the house for emergency exits. Craft added the door to the blueprint, but after the foundation and subflooring were done, we saw that the laundry room was high off the ground. So there was no choice but to turn what was supposed to be a quick and convenient back entry way into an elaborate production with stairs and a small landing. We never use it, but it is there if needed for an emergency exit. Judy's house has a concrete patio in the back and concrete front porch. The concrete was dyed, stained, and a rock pattern stamped onto it. see the preceding link for details. How involved do you want to be?